My sweet sister-in-law is expecting a little boy. So naturally I offered to host a baby shower. She actually got two baby showers because her family lives an hour away. So rather than have a bunch of people drive that far it was determined that it would be easier just to have one in each location. The invites I posted yesterday were for the other shower. Kari had asked me to make both and I was happy to help. To keep it simple (and cute) I decided to just go with the rain shower theme and stick with light blue, gray, and yellow. I used the Hardwood and Inviting stamp sets as well as the Decorative Dots embossing folder for the clouds and Watercolor Wonder DSP for the banners. Soft Sky card stock with Soft Sky in really add a nice pattern to the background. For the clouds and Soft Sky piece I used the My Digital Studio kit Sweet Dreams with my Silhouette to cut out all the pieces. It's not nearly as pretty as in real life, but behind the rain drop cut outs you can see the sparkle of some Silver Glimmer paper. I finished them off with some Daffodil Delight stitched grosgrain ribbon that is now retired. I just love that bright banner like a ray of sun shine poking out behind the clouds! I also had a lot of fun creating the inside panel with all the necessary information in a subway art kind of style. Some of the information has been changed to protect privacy. I had so much fun with these! I also made several extra so there are a few sets sitting in my Etsy store. 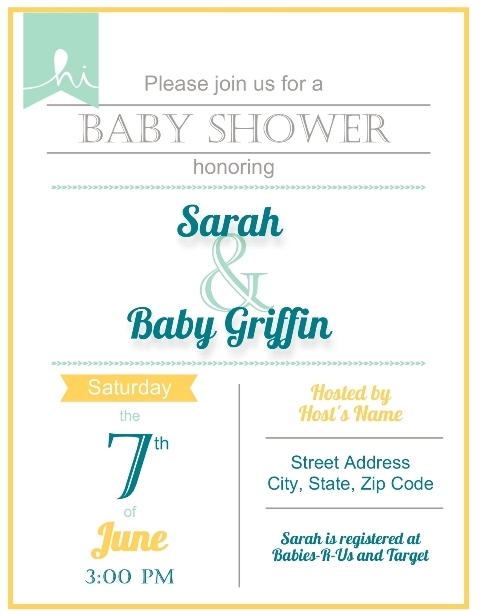 Click on over to get some if you have a need for some adorable baby shower invitations!